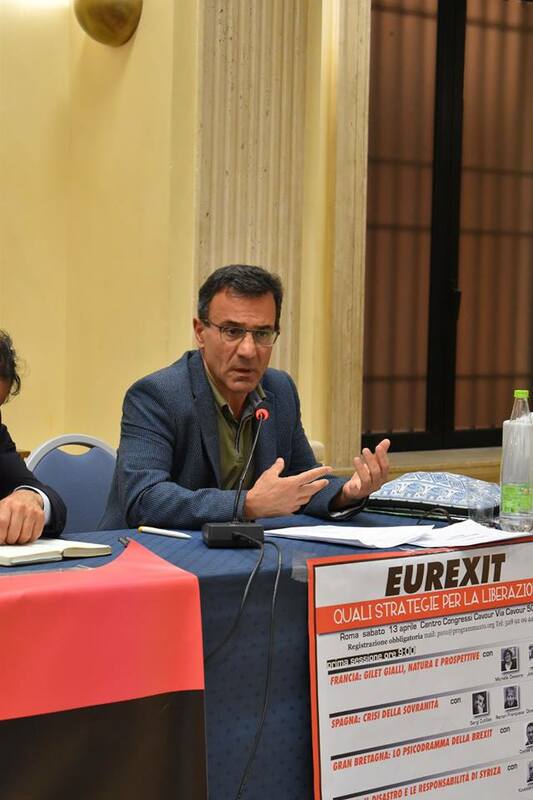 Am Rande des Eurexit-Forums in Rom am 13. April 2019 warte der britisch-griechische Volkswirt Costas Lapavitsas vor den gefährlichen Konsequenzen der Aufschiebung des Brexit und forderte die Intensivierung des Kampfes für einen sozialistischen Austritt. Die Verschiebung des Brexits ist eine sehr schlechte Entwicklung. 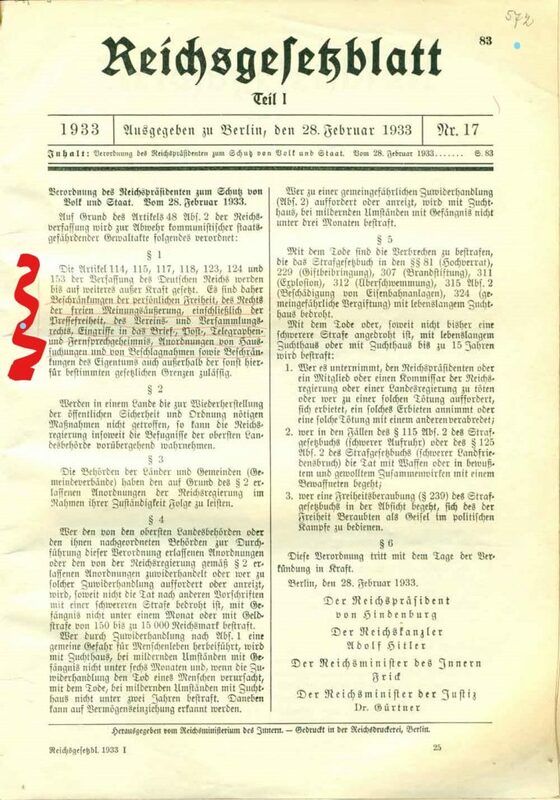 Zunächst müssen wir die Gründe für die Aufschiebung verstehen. DIE DISKRETE PROPAGANDA DER €-IDEOLOGEN UND IHRE MANIPULATIONEN: Wer profitiert vom €, wer verliert? Fundstücke 1 DIE ELITEN UND IHR EURO: WER HAT VON DER WÄHRUNGSUNION GEWONNEN? The forum happened while the « European construction » is about to celebrate the 60 years of existence of the Rome Treaty on March 25, 2017, after the 25th anniversary of the Maastricht Treaty. A sad statement for the peoples that suffer from them. All the speakers highlighted the disastrous consequences deriving from the euroliberal policies inflicted to the citizenry. They shed light on the impossible reform of the system, which has been designed and organized to reduce and then suppress national and people’s sovereignty. The citizenry understood that the real problem is the European Union. Yet, some still proclaim « an A plan and a B plan » again and again – such plans that have been implemented in Greece and have proved to be complete failures, as shown by the destitution in which the Greek people is now. These great supporters of Syriza suggest the same solution that Mr Tsipras has carried out : « negociate again and again ». Their A plan : to discuss with the EU to change the ECB status. Yet, in order to change that key point, the unanimous agreement of the 28 Member-States is required. It is obvious then that all the EU Member-States governments are hostile to this idea and most likely for still a very long time. As for the B plan, which plans a grouped, negociated exit, this is only a new smokescreen engineered to slow down the exit process – tergiversations that protect policies favorable to financial interests. The EU has been designed and built to suppress national sovereignty and maintain policies favorable to the dominating classes. It is a locked system which cannot be modified from the inside. The only way to a solution is the unilateral way out to build a Europe of nations. 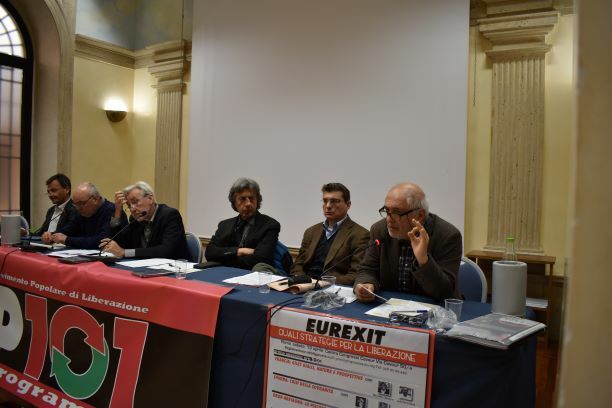 – Supporting and calling to demonstrate on March 25 in Rome during the march set up by a network of organizations and personalities against the celebration of the 1957 Rome Treaty by the 28 EU Member-States heads of government. For the European Coordination to Exit the Euro, the EU and NATO, March 25 must be a day to march and fight against this « European construction » and to exit the euro, the EU and NATO, and to restore national and people’s sovereignty. – Supporting and calling to demonstrate on March 25 – Greek National Day – in the morning at the Greek embassies of European capital cities, requiring the restoration of human rights in Greece. – Organizing the 5th International Forum of the European Coordination to Exit the Euro, the EU and NATO, in Barcelona (Spain) during Fall 2017, opened to the public and the press. – Calling to reinforce the Coordination and to create an international front to implement common and coordinated initiatives. – Promoting the largest unity possible in all the countries to defend the social and economic rights of the working and middle classes, and to fight against the adjustments and budget cuts required by the Troika.